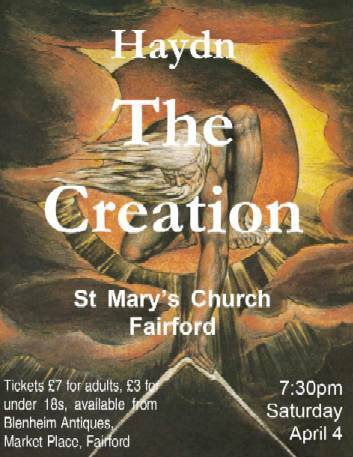 Accompanied by Dionysus Ensemble (leader Leonie Adams) and Robin Baggs (organ). 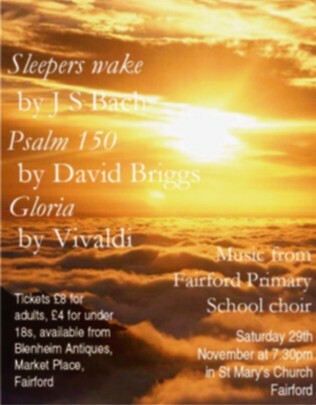 and Ralph Vaughan Williams – Fantasia on Christmas Carols. 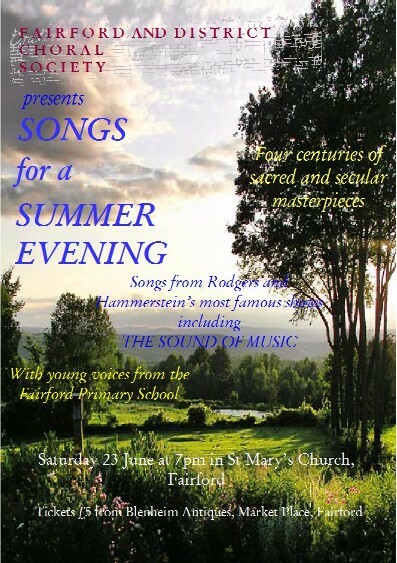 Music by Britten, Byrd, Elgar, Finzi, Gibbons, Holst, Parry, Tallis and Vaughan Williams. Handel's Dettingen Te Deum and Parry's I was Glad. 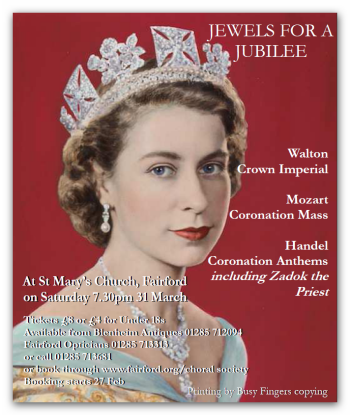 Handel’s Coronation Anthems and Mozart’s Coronation Mass. 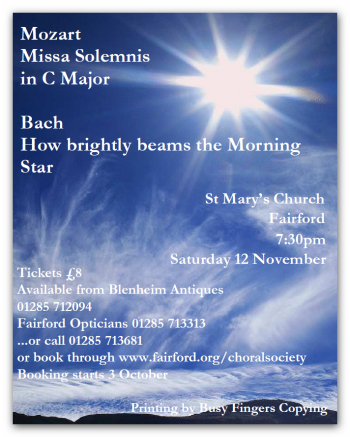 See the Poster and Programme. Bach's Cantata no 1 and Mozart's Missa Solemnis in C Major. 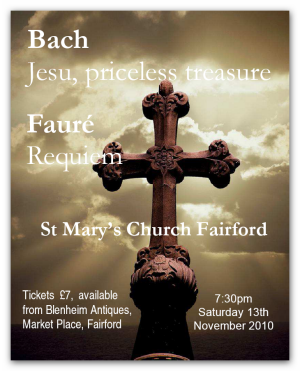 Jesu, Priceless Treasure by J S Bach and Requiem by Gabriel Fauré, with contributions from the choir of Fairford Primary School. 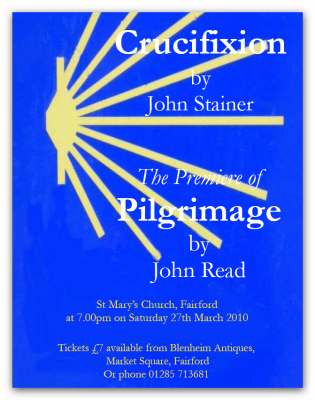 Crucifixion by John Stainer and Pilgrimage by John Read (a Cantata resulting from a pilgrimage made to Santiago de Compostella over three years, 2000-03). 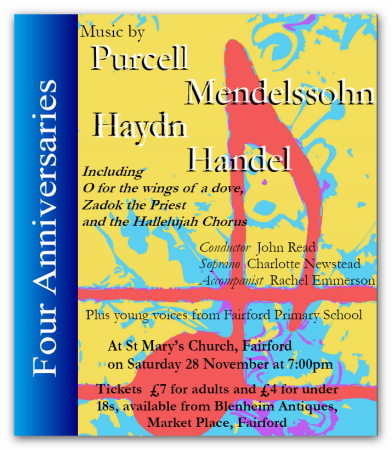 An Anniversary Miscellany including pieces by Purcell, Haydn, Handel and Mendelssohn, with additional contributions from the choirs of Fairford Schools. 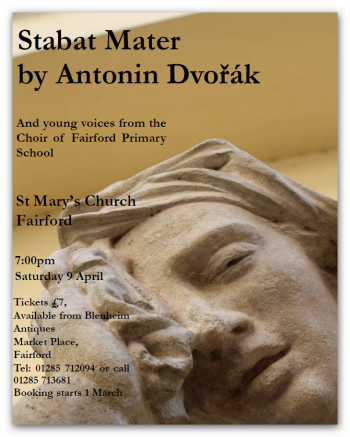 Featuring Fairford Primary School and Kate Hicks Beach (mezzo soprano). 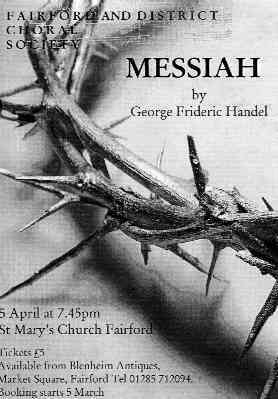 5 April 2008: Handel's Messiah. 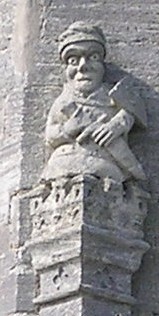 See Poster, Photographs and Video. and John Ireland's Greater Love Hath No Man.